SHINEQUIP ABLE TO PROVIDE HT400,W440,W446,F SERIES,PZ-9.PZ11,TEE165,TEE300 mud pump and weatherford high pressure servicing pump,TB3404 well service pump. F Series mud pump: General features: Mud pump is rigid and compacted with excellent performance, which is applicable to high pump pressure and large discharge for well drilling in oil field. 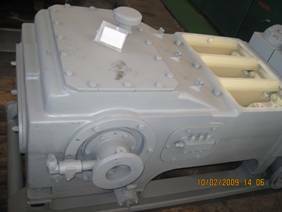 These pumps have long stroke range and low numbers of stroke so that it can improve inlet performance of pump and extend life of easy-broken parts, besides, structure of air bag is advanced and reliable. ● Features of dynamic end: A-gear wheel transmission without slot, alloy steel overall crank shaft, dynamic end is lubricated with forced and splashed lubricating oil. ● Frame: Frame is welded with steel plate, stress must be removed after welded, it is rigid and powerful, and bearing of crank is made from reinforced steel plate. ● Pinion shaft: Pinion shaft is made from alloy steel forgings, and A-gear wheel with middle rigid tooth is processed on shaft. ● Crank shaft: Crank shaft is made from alloy steel forgings, wherein tooth of big wheel is A-tooth and two ends of crank shaft are double column radial ball bearing. ● Piston: Piston and middle rods are connected with pipe hoop for easy installation. 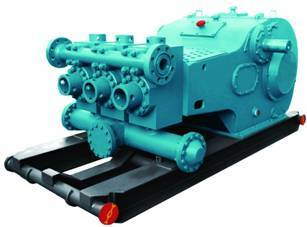 ● The mud pump meets the API Spec 7K ,is allowed to use the API Monogram. PLEASE CONTACT SHINEQUIP FOR MORE SPEC.